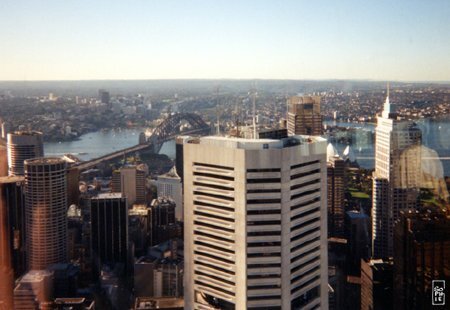 Seen from Centerpoint tower, to the north is the Harbour Bridge. The cylindric tower in the foreground lower left is Australia Square. You can get a glimpse of the white roofs of the Opera House on the shore. Vu de la tour Centerpoint, le pont Harbour Bridge est du côté nord. La tour cylindrique devant en bas à gauche est Australia Square. On peut apercevoir les toits blancs de l’Opéra au bord de l’eau.